I disembarked in the town square by the gate to the temple where a couple of Tibetan mastiffs were basking in the sun, their black fur speckled with dust. First I dropped off my bags at JyaDrolma's Guesthouse, and then at midday I visited the temple and the monastery, where young monks sat on the ground and ate tsampa with their fingers out of metal bowls. Climbing a hill, I looked down at the yard of white stupas and watched people – especially old ladies – circumambulate the temple as they turned its large prayer wheels in passing. The oxbow curve of a frozen river glistened in the sun. I wondered what it would be like to come live in Tagong. It turns out that I would not be the first American to do that. On the day I left Tagong I met a woman named Angela who lived there. She had grown up in a small town in Colorado and attended Williams College in Massachusetts. After graduating she joined the Peace Corps and was placed in Chongqing as a teacher. A few months after moving to China she took a hiking trip to west Sichuan and met a young Tibetan nomad named Djarga. Eventually they married and had a child together. She now runs a handcrafts co-operative from Tagong, helping the people of Kham to market their traditional crafts – handbags, garments, tsampa containers and much more – to a foreign demographic. She works with multiple nomadic clans in the area, including Shamalong, Reseer, Raleh and her husband's clan of Genup. In the near future she is hoping to open up a shop in Tagong. She and her two year-old daughter Somtso were on their way to Chengdu to accompany their friend Soko, a young woman who needed a dentist. Soko had not traveled farther than Kangding in 20 years and was eager to return to Tagong as quickly as possible. Others on the bus were also seeking medical care. By talking to Angela I realized how difficult life in Tagong must really be. There are no hospitals or permanent doctors in the immediate vicinity. 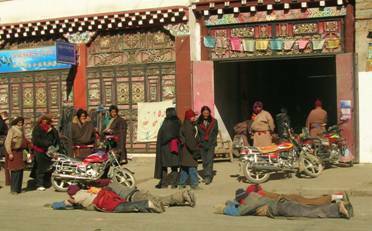 The diets of Tagong residents are very limited and many residents suffer from deficiencies. The nomads have historically relied largely on meat for food and income, but in recent years have been abstaining from killing their animals for religious reasons. Many buildings, including Angela's house, lack running water. Houses are also poorly insulated from the cold, and the lack of a satisfactory trash disposal system has led to the needless spread of disease. But people smile in Tagong, even in the winter. They leave the warmth of their wood stoves and trickle out of their stone houses as the town thaws out in the middle of the day, to browse, shoot pool and gossip. In the summer the grasslands will be dotted with yaks, cows and felt tents, and in the autumn droves of nomads and tourists will come to watch the annual horse racing festival. I hope to come back and see that, but it was nice to have a whole Tibetan town to myself for one cold winter day in January. To buy Kham Tibetan crafts, arrange a tour or volunteer in Tagong, check out Angela's website at www.definitelynomadic.com.